Regional Economic Development Council conducted a study ? shermen can sell their catch direct to the public. “It has been to de? 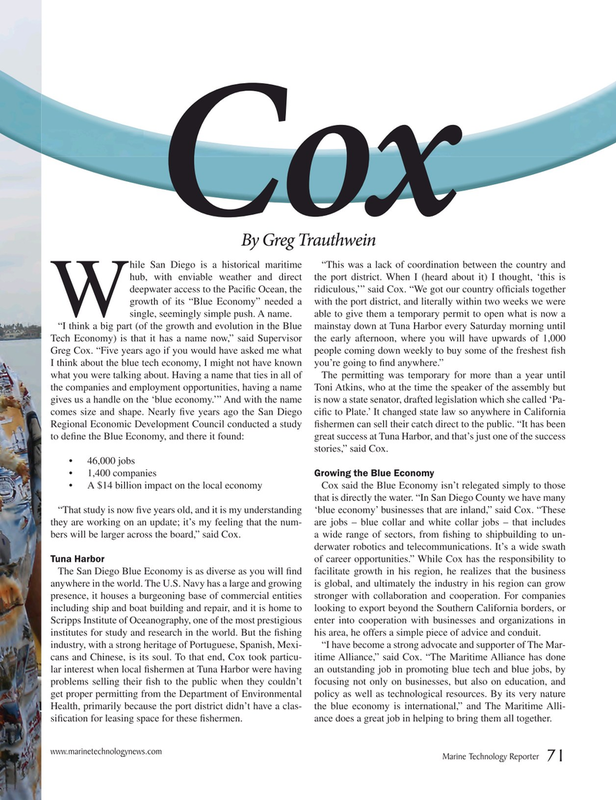 ne the Blue Economy, and there it found: great success at Tuna Harbor, and that’s just one of the success stories,” said Cox. Scripps Institute of Oceanography, one of the most prestigious enter into cooperation with businesses and organizations in institutes for study and research in the world. But the ? shing his area, he offers a simple piece of advice and conduit. Health, primarily because the port district didn’t have a clas- the blue economy is international,” and The Maritime Alli- si? cation for leasing space for these ? shermen. ance does a great job in helping to bring them all together.